Melt butter and soy together in a small bowl (Microwave them for about 1 min) and toss with nuts. Spread the buttered nuts on a microwavable plate and microwave them for about 5 minutes on high setting, stirring every 2 minutes. Add the spice powders to the nuts and mix well. 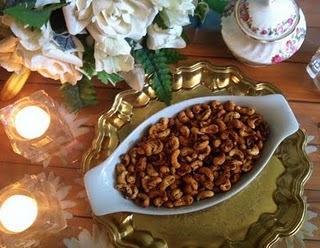 Microwave the buttered and spiced nuts for about 3 minutes or until golden brown and roasted. Set aside to cool. Transfer to a serving dish and serve as munchie. Don’t forget to warm them up for your party!